One of the most appealing features of Yorkshire’s landscapes is its rivers. The district of Bradford is no exception to this with water everywhere – from springs to becks to the River Aire. Our visions are about managing the catchment of the Bradford Beck and its tributaries, which flow through the city. Watercourses have always been important to Bradford but they now need revitalising so that they can play a greater part in place-making and economic regeneration and contribute to Safer, Cleaner, Greener Neighbourhoods. Bradford Beck is a small river system of around 11 km that flows through the City of Bradford. It starts as a collection of tiny tributaries in the west of the City which coalesce into one waterway which flows eastwards towards the city centre, gathering momentum and size. When in the city centre in its underground channel, it takes a northerly turn through the Bradford Valley and towards Shipley. 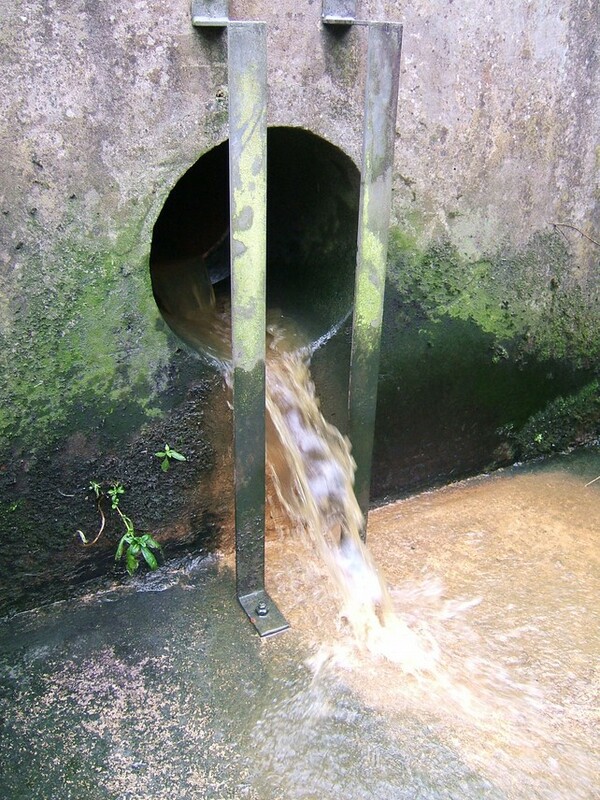 The Beck was mistreated during the industrial revolution resulting in a legacy of hidden and culverted sections, a loss of natural banks and issues with substantial water pollution. There have been major improvements in water quality in the 20th century but no significant improvements in the physical character of the river. The end result is that the Beck is now classified as “poor ecological quality” under the Water Framework Directive. This plan represents the opportunity to understand how the Beck might be restored to be an asset the city is proud of and which contributes positively to the future. In order to escape the recurrent flooding problems every decade and the unpleasant polluted state of the Beck the waterway became culverted and eventually disappeared in the city centre, probably before 1900. About 1.5 km to the west of the city centre the Beck’s level drops around 5 metres on two weirs and enters an underground culverted section. This hiding of the Beck became common with its shape becoming increasingly artificial over time. By the early 1970’s it was a heavily modified waterway with prominent signs on its banks denoting it as ‘contaminated water’. Fly-tipping and poor riparian management decisions since that time have further scarred the Beck and its tributaries. The legacy of the industrial revolution in Bradford is a significant one with the Beck bearing a history of 200+ years of neglect within a heavily built up urban landscape. The Bradford Beck project is one of 25 pilot projects across the UK that have been funded by DEFRA in order to look at new ways of preparing catchment management plans. In order to plan a better future to the Beck system the project was initiated in early 2012. This initiative has brought a wide variety of stakeholders together from across the city to create this plan and to align with the strategies of the Environment Agency, Yorkshire Water and Bradford Council. 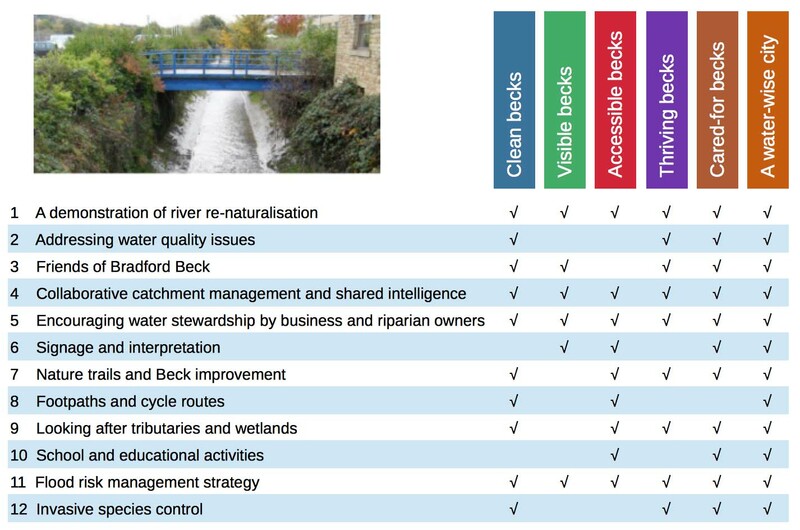 The plan is underpinned by hard data about water quality and the ecology of the Beck system and led by six qualitative visions on how to improve the Beck. These visions set out an aspirational trajectory for long-term restoration of the Beck that will provide a new focus of water based socio-economic regeneration in the city of Bradford: one day our grand-children may see a living river flowing through the city centre! We believe it will have many benefits by making a more attractive place, encouraging economic development, improving community cohesion and public health, and encouraging greater biodiversity. Our activities can be defined by twelve areas. Our activities are important steps towards raising awareness of the becks with the public and land-owners and managing the becks system through cooperation. We will deal with aesthetics and some of the water quality and ecological issues. Each activity will contribute towards our six visions for Bradford’s becks and at the same time support Bradford’s aspirations for economic development and safer, cleaner, greener neighbourhoods. The best thing about all of these activities is that you can get involved.